What an amazing week we lived last week! Million of Arabs; including almost all Yemenis were glued to their TVs, watching the news of what was happening in Egypt. Then, Mubark stepped down and the whole Arab world cheered in joy; like Mubarak was all the Arab countries’ dictator! Immediately, Yemenis went down the street to celebrate the Egyptians’ victory over Mubarak; some of them were put in jail afterwards. I believe in the moment when Mubarak stepped down, Yemenis’ imagination got really unleashed and they do now want to have the same Tunisian and Egyptian experiences. Yemenis want to represent the domino effect! Today, many people celebrate the Valentine’s Day around the world. Therefore, I take this chance to declare that in love I trust to get my country out the difficult time it’s witnessing, safely. Even though it’s a painful feeling to keep getting much news about a colleague journalist or a lawyer or any Yemen citizen that was put in jail just because he went out down the street to say his word and try to be heard, I keep my greatest affection to my beloved Yemen. Since I truly love my country, I want nothing but the best for it. Unfortunately, it’s continuously reported in the news and reports that Yemen is the poorest country among the Arab countries; and I frankly don’t think so! The factual description for Yemen will be that it’s the most corrupted country among the Arab countries and its people are just fed up with that! In my impression, even the opposition parties are as corrupted as the ruling party is. That leaves a big question mark on the destiny of Yemen if Saleh literally steps down. Youth initiative said. Saleh promised to bring reforms and I tell him more freedom of expression must be one of that reforms. From youth point of view, Tunis and Egypt allowed the Yemenis to think limitlessly. Meaning, take me as an example; I was always thinking that I could do nothing about the bad situation I see every day and now that changed, thanks to Tunis and Egypt. 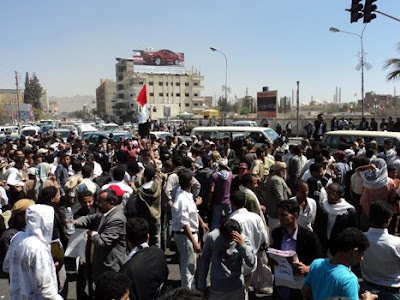 People could really have power something I never thought before in Yemen. Now I realize that people are who really matter after all, not the dictatorship who keeps telling me that it’s the country and it’s only who counts. 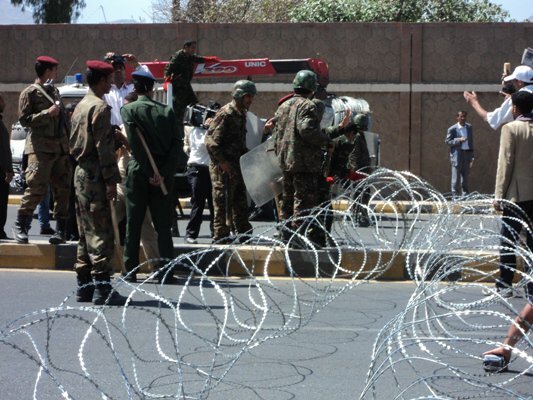 The bottom line is that Saleh must realize democracy now on the ground. If he’s truly willing to have real reforms, democracy, freedom of expression, freedom of press, and not jailing me; he should think about.